Face masks are an absolute must among other things if you want healthy and smooth skin and it's very easy to make a nourishing face mask by using ingredients which are available right in your kitchen at a very low cost and since you are in control of the ingredients that will be used to whip up the face mask that means there are no harmful chemicals involved, yay! 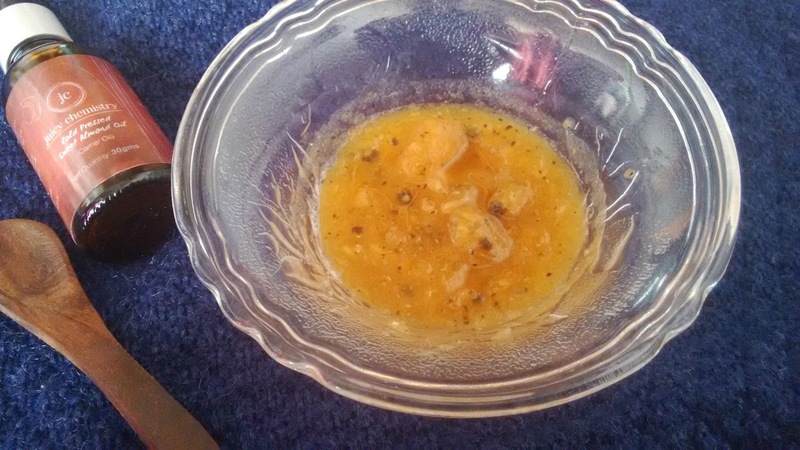 The particular face mask recipe that I am going to share is made using the goodness of papaya seeds and honey, which will provide hydration to the skin other than making the skin smooth, brightening up the complexion and ridding your skin of dead skin cells. While one application won't show miraculous result but it will definitely make the skin soft. And to see proper results, one has to use it consistently! Check out the recipe for this easy peasy DIY face mask below! Blend papaya seeds (my papaya didn't have that many seeds so I used a piece of papaya), honey and lemon juice in a blender till it turns into a fine paste and the seeds are grind well. Pour the mixture into a clean bowl, add sweet almond oil and stir everything well. Apply the mask on a clean and dry face, leave it on for 10-15 minutes before rinsing off with tepid water. While rinsing off, massage your face super gently using circular strokes in order to remove dead skin cells. The mask can be stored up to a week in the fridge. Papaya contains papain, which are special enzymes that can help in exfoliating the skin by breaking down skin cell's surface. These enzymes lock in moisture, reduce pore size and keep wrinkles at bay. Raw honey acts as a natural emollient that increases water content in skin and reduces dryness. It also helps in tissue healing and regeneration. The powerful botanical in honey neutralises blemish and wrinkle-causing free radicals. Being a lightweight oil, it easily penetrates into the deeper layers of skin by softening and dislodging the dirt and debris. This carrier oil prevents blackheads and acne. Almond oil can be used on sensitive skin too as it is not likely to cause skin infections. Buy the one I use HERE. It's not advised to use rub lemon directly on the face, but it could be mixed with face masks to reap its benefits. The vitamin C and citric acid content in lemon juice act as a natural bleach. Lemon juice bleaches freckles and tiny dark spots. However, do not expose your skin to sunlight for at least 12 hours after using lemon because it causes a photo-toxic reaction. Note: Although the mask is made using natural ingredients, a patch test is still recommended. Let me know if you try this mask in the comments below. Thank you Sonali :) Yes, we will be posting more DIYs in future.